Warsaw ( Polish: Warszawa, [varˈʂava] , in full The Capital City of Warsaw, Polish: Miasto Stołeczne Warszawa) is the capital of Poland and its largest city. It is located on the Vistula river roughly 370 km from both the Baltic Sea coast and the Carpathian Mountains. Its population as of 2005 was estimated at 1,697,596, with a metropolitan area of approximately 2,879,000. The city area amounts to 516.9 km², with an agglomeration of 6100.43 km² (Warsaw Metro Area - Obszar Metropolitalny Warszawy). Warsaw straddles the Vistula river, approximately 370 kilometres from both the Carpathian mountains and Baltic Sea. It is located in the heartland of the Masovian Plain, and its average altitude is 100 m above sea level, although there are some hills (mostly artificial) located within the confines of the city. 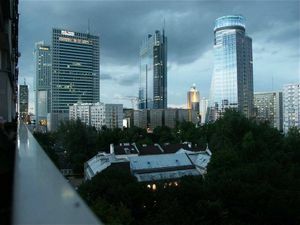 Warsaw's climate is continental humid. The average yearly temperature is 8 degrees Celsius (-2 °C in January and 18 °C in July). Temperatures may often reach 30°C in the summer. Yearly rainfall averages at 680 mm, the most rainy month being July. 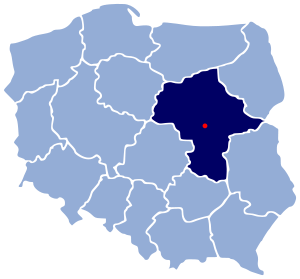 Warsaw is a powiat (county), and is further divided into 18 boroughs, each one known as a dzielnica ( map), each one with its own administrative body. Each of the boroughs is divided into neighborhoods which are not officially recognized by the city but known by most Varsovians. The best known neighborhoods are the Old Town (Stare Miasto) and New Town (Nowe Miasto) in the borough of Śródmieście. 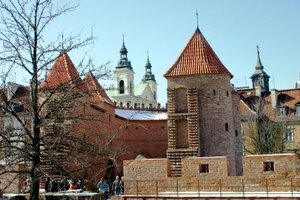 The first fortified settlements on the site of today's Warsaw were Bródno (9th/10th century) and Jazdów (12th/13th century). After Jazdów was raided in 1281 by Boleslaus II, the Duke of Płock, a new similar settlement was lodged on the grounds of a small fishing village called Warszowa. In the beginning of the 14th century it became one of the seats of the Dukes of Masovia, in 1413 becoming the capital of Masovia. Upon the extinction of the local ducal line, the duchy was reincorporated into the Polish Crown in 1526. In 1529 Warsaw for the first time became the seat of the General Sejm, permanent since 1569. In 1573 Warsaw gave its name to the Warsaw Confederation, an agreement by the Polish gentry to tolerate different religious faiths in the Kingdom of Poland. 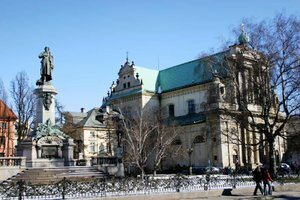 Due to its central location between the Polish-Lithuanian Commonwealth's capitals of Vilna and Cracow, Warsaw became the capital of the Commonwealth and at the same time of the Polish Crown in 1596, when King Sigismund III Vasa moved the capital from Cracow. 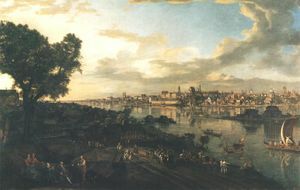 Warsaw remained the capital of the Polish-Lithuanian Commonwealth until 1795, when it was annexed by the Kingdom of Prussia to become the capital of the province of New East Prussia. Liberated by Napoleon's army in 1807, Warsaw was made the capital of the newly created Duchy of Warsaw. Following the decisions of the Congress of Vienna of 1815, Warsaw became the centre of the Polish Kingdom, a constitutional monarchy under a personal union with Imperial Russia. Following the repeated violations of the Polish constitution by the Russians, the 1830 November Uprising broke out. However, the Polish-Russian war of 1831 ended in the uprising's defeat and in the curtailment of the Kingdom's autonomy. On 27 February 1861 a Warsaw crowd protesting the Russian rule over Poland was fired upon by the Russian troops. Five people were killed. Underground Polish National Government resided in Warsaw during January Uprising in 1863-1864. Warsaw became the capital of the newly independent Poland again in 1918. Warsaw flourished in the late nineteenth century under Mayor Sokrates Starynkiewicz ( 1875– 1892), a Russian-born general appointed by Tsar Alexander III. 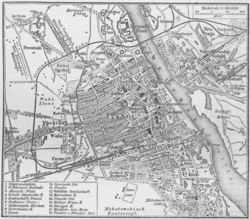 Under Starynkiewicz Warsaw saw its first water and sewer systems designed and built by the English engineer William Lindley and his son, William Heerlein Lindley, as well as the expansion and modernization of trams, street lighting and gas works. In the course of the Polish-Bolshevik War of 1920, the huge Battle of Warsaw was fought on the Eastern outskirts of the city in which the capital of Poland was successfully defended and the Red Army defeated. Warsaw is notable among Europe's capital cities not for its size, age, or beauty, but for its indestructibility. It is a phoenix that has risen repeatedly from the ashes. Having suffered dreadful damage during the Swedish and Prussian wars of 1655– 1656, it was again assaulted in 1794, when the Russian army massacred the population of the right-bank suburb of Praga. Its most remarkable act of survival, though, was its rebirth following its almost complete destruction during the Second World War. The Second World War began when Germany invaded western Poland on 1 September 1939. On 17 September eastern Poland was invaded by the USSR. Poland capitulated after 6 weeks of fighting. Western Poland was incorporated into the German Reich, eastern Poland into the USSR, while central Poland, including Warsaw, came under the rule of the General Government, a Nazi colonial administration. In the course of the Invasion of Poland, Warsaw was severely bombed, and in the course of the Siege of Warsaw approximately 10 to 15% of its buildings were destroyed. Warsaw became an occupied city under the control of the Nazi SS. All higher education institutions were immediately closed and Warsaw's entire Jewish population — several hundred thousand, some 30% of the city — herded into the Warsaw Ghetto. When the order came to liquidate the Ghetto as part of Hitler's " final solution", Jewish fighters launched the Warsaw Ghetto Uprising. Despite being heavily outgunned and outnumbered, the Ghetto held out for almost a month. When the fighting ended, the survivors were massacred. During 1943 and 1944 the tide of the war turned, as the USSR, which had been at war with Germany since 1941, inflicted a number of severe defeats on the German army. By July 1944 the Soviets were deep into the Polish territory, pursuing the Germans toward Warsaw. Knowing that Stalin was hostile to the idea of an independent Poland, the Polish government-in-exile based in London gave orders to the underground Home Army (AK) to try to seize the control of Warsaw from the Nazis just before the Soviets arrive. Thus, on 1 August 1944, as the Soviet army was nearing the city very fast, the Home Army and the general population started the Warsaw Uprising. Despite Stalin's hostility towards Poland, the Poles had expected that the Soviet troops would assist them against their common German enemy. However, after the Red Army captured the right-bank Warsaw, the Soviet offensive was abruptly stopped, while the Germans went on to ruthlessly suppress the uprising. Although the insurgency, planned to last 48 hours, held out for 63 days, eventually the Home Army fighters were forced to capitulate. They were transported to the POW camps in Germany, while the entire civilian population was expelled. 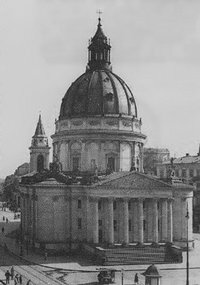 Hitler, ignoring the negotiated terms of the capitulation, ordered the entire city to be razed to the ground, and the library and museum collections robbed or burned. When on 17 January 1945 the Soviets crossed the Vistula and entered through the left-bank, they found a Warsaw that had almost ceased to exist; 85% of the city had been destroyed, including the historic Old Town and the Royal Castle. The surviving Home Army fighters were rounded up by the NKVD and either murdered or deported to Siberia. The city was once considered a shining metropolis, but due to total destruction, it has lost its baroque tinge. Although many of the destroyed significant historical buildings were restored, little remains of the resplendence of Warsaw baroque. After the war, Boleslaw Bierut's puppet regime set up by Stalin made Warsaw the capital of the communist People's Republic of Poland, and the city was resettled and rebuilt. Large prefabricated housing projects were erected in Warsaw to address the housing shortage. Few of the inhabitants of the pre-war Poland returned: Hundreds of thousands were dead, thousands more in exile from the new regime. Nonetheless, the city resumed its role as the capital of Poland and the country's centre of political and economic life. Many of the historic streets, buildings, and churches were restored to their original form. In 1980, Warsaw's historic Old Town was inscribed onto UNESCO's World Heritage list. In 1995 the Warsaw Metro finally opened, and with the entry of Poland into the European Union in 2004, Warsaw is currently experiencing the biggest economic boom of its history. 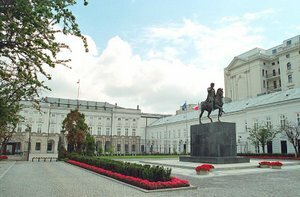 Presidential Palace, Warsaw, with equestrian statue of Prince Józef Poniatowski by Bertel Thorvaldsen. There are approximately 30,000-35,000 Vietnamese people living in the Warsaw Municipal area. Following the Warsaw Act (Ustawa warszawska) of October 27, 2002, the President of Warsaw carries out the executive duties in the city. His prerogative is, among others, governing the city-owned property that constitutes a major part of the city. The current acting President of Warsaw is Kazimierz Marcinkiewicz. Hanna Gronkiewicz-Waltz was elected in the local elections on November 26, 2005. The Warsaw Act abolished all the former counties around Warsaw and formed one city powiat with a unified municipal government. Legislative power in Warsaw is vested in a unicameral City Council (Rada Miasta), which comprises 60 members. Council members are elected directly every four years. Like most legislative bodies, the City Council divides itself into committees which have the oversight of various functions of the city government. 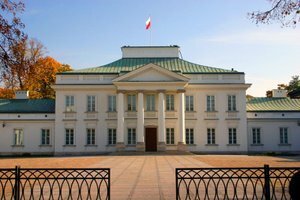 Bills passed by a simple majority are sent to the mayor (the President of Warsaw), who may sign them into law. If the mayor vetoes a bill, the Council has 30 days to override the veto by a two-thirds majority vote. As the capital of Poland, Warsaw is the political centre of the country. 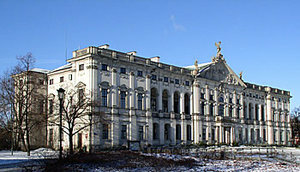 All state agencies are located there, including the Polish Parliament, the Presidential Office and the Supreme Court. In the Polish parliament both the city and the area are represented by 31 MPs (out of 460). Additionally, two politicians were recently elected MEPs. Although Warsaw was heavily damaged during World War II and reconstruction in the fifties widened many streets, the city is currently plagued with traffic problems. Public transportation in Warsaw is as efficient as it is ubiquitous, serving the city with buses, tramways, and metro. Warsaw lacks a good circular road system and most of the East-West traffic goes directly through the city centre. Currently two circular roads are under construction. The first (called OEW, or Obwodnica Etapowa Warszawy) is to lead the traffic approximately 10 kilometres from the city centre through the city streets and two newly-built bridges. The other is to become a part of both the A-2 motorway (itself a part of the European route E30 from Berlin to Moscow) and the S-7 ( Gdańsk– Kraków) express road, and will run through a tunnel under the southern area of Ursynów. It is to become available between 2008 and 2010. A lot of streets are named after famous Polish people or places. Warsaw has one international airport, Warsaw Frederic Chopin Airport, located just 10 km away from the city centre. With over 60 international and domestic flights a day and with over 7,070,000 passengers served in 2005, it is by far the biggest airport in Poland. Immediately adjacent to the main Frederic Chopin Airport terminal complex, Terminal 1, is the Etiuda terminal, serving both the domestic and the international routes flown by low-cost carriers. A new terminal, Terminal 2 is now under construction in order to alleviate current overcrowding, and to extend the airport's capacity by another 6 million passengers. Also, an ex-military airfield in the town of Modlin, 20 km north of Warsaw, is currently being redeveloped into an airport for low-cost carriers, cargo and charter traffic. It will not be ready for use before September 2007. There are also plans to build an entirely new international airport, mostly for service to other European Union countries. Its location has not yet been determined. Mass transit in Warsaw consists of four branches ( buses, streetcars, metro and regional rail) united in the ZTM (Zarząd Transportu Miejskiego or the Warsaw Transport Authority). Additional lines are operated by private companies and the state-owned railways. There are three tourist routes: "T" which is operated by a historic tram in July and August, "100" which runs on weekends and is operated by the only double-decker bus owned by the city, and "180" which follows the Royal Route from the War Cemetery in the North, via The Royal Way to Wilanów, near the palace. The first tramway in Warsaw was opened on 11 December 1866. On 26 March 1908, all the lines, previously horse-powered, were electrified. In the period between the world wars, the tramway was nationalized and the net was extended significantly. After the Defence War of 1939 the service was halted for approximately three months due to war losses. Heavy aerial bombardment during the siege of Warsaw and requisition of all modern streetcars by the new German authorities postponed the reintroduction of service. However, by 1940 the trams were back on track. In 1941 the present colours of the cars were introduced (yellow and red, in the Flag of Warsaw colours. This was done to demoralize the Poles in the city by attempting to wipe out all traces of the white and red colours of Poland. Up until this point, the trams were painted either in a white and red mixture, or entirely red). Following the Warsaw Uprising the tramway was destroyed by the Germans until the liberation of the ruins in January 1945. The streets were filled with rubble, the tram stations destroyed, and the cars either burnt or transported to Germany. However, the first streetcar line was opened again for the public on 20 June 1945. Following the Second World War the tramway in Warsaw underwent fast development. The tracks reached all the principal parts of the city. However, in the sixties the official policy of both Polish and Soviet authorities promoted the use of Soviet oil and the concomitant exportat of the Polish coal. The availability of coal on the home market decreased, and the tramway net was shortened, while more buses were bought. Until 1989 only 28 lines were preserved. Currently the Tramwaje Warszawskie company runs 863 cars on almost 470 kilometres of track. Twenty-nine lines run across the city with additional lines opened on special occasions (such as public holidays or All-Saints Day). After World War II most of the communication network in Warsaw was destroyed. The streets were filled with rubble, and the streetcar infrastructure was either transported to Germany by the Wehrmacht or destroyed. However, the city entered the path of quick reconstruction and was in need of a transport network both cheap and efficient. In 1946 several dozens of trolleybuses were brought in from the Soviet Union and first two lines were soon opened. The trolleybuses were using ex-tramway lines and the lines ran from Union of Lublin square (Plac Unii Lubelskiej) to Warszawa Gdańska train station, and from Łazienkowska depot to the city centre (Piękna street area). In March 1946 a second line was opened (Plac Saski–Bonifraterska), but was closed and replaced by streetcars in December. However, the reconstruction of the tramway was halted, mostly for political reasons, and until 1955 5 new trolleybus lines were opened, covering most of the city centre. 1967 started a period of fast decline in both the number of trolleybuses and the trolleybus lines in Warsaw. PZPR policies under Edward Gierek assumed that as much Polish coal as possible be exported while the oil be imported at very low prices from the USSR. It was decided that production of electricity should be lowered in order to spare resources and by 7 July 1973 all trolleybus lines in Warsaw were closed. The last period of Warsaw trolleybus transportation started in 1977, when it was decided that the existing cars could be used as a means of mass transit between Warsaw and the southern suburb of Piaseczno. An additional line was planned through Wilanów (now part of the city), Powsin and Konstancin-Jeziorna. However, economic crisis made construction of the latter line impossible, and only the Piaseczno line was opened on 1 July 1983. After the system transformation of 1989 it became apparent that the trolleybuses were in dire need of replacement (those used were built in early 1950s), and that the maintenance costs of running a single line were very high. On 1 September 1995 the Warsaw City Council decided that all services on the 51 and 651 lines be halted. In July 2000 the trolleybus depot in Piaseczno was closed and the remaining cars sold to Minsk, Lublin (where most of them languish in a field behind the main area of a trolleybus depot awaiting refurbishment and return to service; a lack of funds prevents this from going ahead) and to various museums. The first railroad reached Warsaw in 1845 (the Warsaw-Vienna Railway). Nowadays Warsaw is one of the main railway nodes and exchange points in Poland. Cheap and fairly efficient, the PKP (Polskie Koleje Państwowe, or Polish State-owned Railways) are one of the principal means of transport in Poland. The railway crosses under the city through a tunnel (tunel średnicowy). It is approximately 2.2 km long and runs directly under the city centre. It is part of an east-west line connecting the Warszawa Zachodnia, Warszawa Centralna and Warszawa Wschodnia train stations through the tunnel and a railway bridge over the Vistula River. From 1833 to the outbreak of World War II, Teatralny Square (Theatre Square) was the country's theatrical and cultural hub and home to the following theatres from 1833. 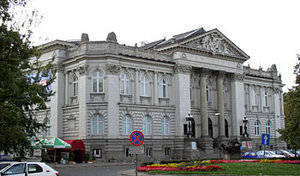 The main building housed the Teatr Wielki from 1833-1834, the Rozmaitości Theatre from 1836 to 1924 and then the National Theatre, the Reduta Theatre from 1919 to 1924, and from 1928 to 1939 - the Nowy Theatre, which staged productions of contemporary poetical drama, including those directed by Leon Schiller. Nearby, in the Saski (Saxon) Garden, the Summer Theatre was in operation from 1870 to September 1939, and in the inter-war period, the theatre complex also included Momus, Warsaw's first artistic literary cabaret at 29 Senatorska St., and Leon Schiller's musical theatre Melodram at 29 Senatorska St. 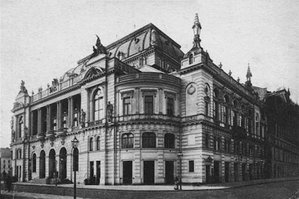 The Wojciech Bogusławski Theatre (1922-1926) at 5 Hipoteczna St., in the former Nowości Theatre building, was the best materialization of "Polish monumental theatre". From the mid-1930's, a Teatr Wielki building at 10 Trębacka St. housed the State Institute of Dramatic Arts - the first state-run academy of dramatic art, with an Acting Department and a Stage Directing Department. Teatralny Square unquestionably can be called the soul of Warsaw. It equals the Saski Garden in its liveliness and activity. Here are concentrated the most important organs in a city's life: the Theatre and the Town Hall, a church, the wine-traders Stępkowski and Boquet, a prime restaurant decorated to ensure the greatest comfort, the offices of Warsaw's most popular newspaper Kurier Warszawski, stationery emporiums, tobacco emporiums, pharmacies, perfumeries, jewellers' shops, clothing and shoe shops, the finest pastry-cooks' shops, emporiums offering lamps, samovars, linen, gowns and furs, fruit shops, cab stops, etc. etc. Such hustle and bustle is not to be found elsewhere in the city. Teatralny Square fully deserves the traveller's interest. Warsaw is home to over 30 major theatres that are spread throughout the city, including the National Theatre (founded in 1765) and the Grand Theatre in Warsaw ( ) (established 1778). Warsaw also attracts many young and off-stream directors and performers who add to the city's theatre culture. 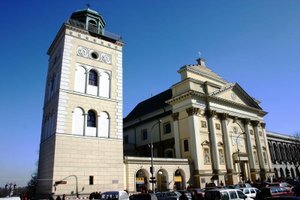 Their productions may be viewed mostly in smaller theatres and Houses of Culture (Dom Kultury), mostly outside Śródmieście (downtown Warsaw). One of the most notable stages in Poland is TR Warszawa (formerly Teatr Rozmaitości). 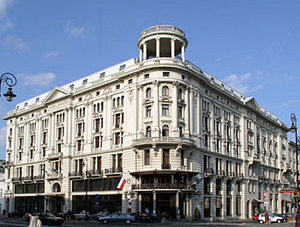 Warsaw hosts the International Theatrical Meetings. 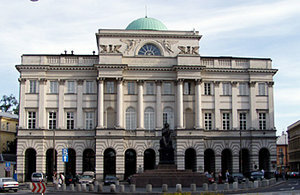 Thanks to numerous musical venues, including the Teatr Wielki, the Polish National Opera, the Chamber Opera, the National Philharmonic Hall and the National Theatre, as well as the music theatres Roma and Buffo and the Congress Hall in the Palace of Culture and Science, Warsaw hosts many renown events and festivals. 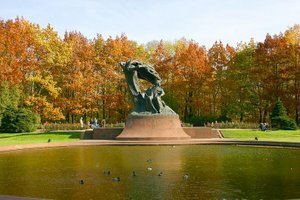 Among the seasonal events worth particular attention are: the International Frederick Chopin Piano Competition, the International Contemporary Music Festival Warsaw Autumn, the Jazz Jamboree, Warsaw Summer Jazz Days, the International Stanisław Moniuszko Vocal Competition, the Mozart Festival, and the Festival of Old Music. 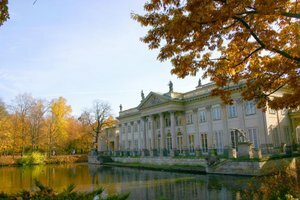 There are many museums and art galleries in Warsaw, most notable are the Muzeum Narodowe, The Polish Aviation Museum, Zachęta Art Gallery, Centre for Contemporary Art, Museum of the Polish Army. 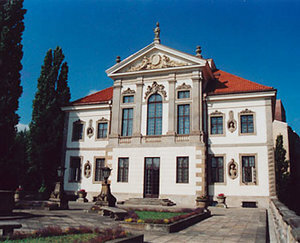 The biggest of them, the National Museum has numerous divisions located in many parts of Warsaw, most notably in the Royal Castle and the Wilanów Palace. Since 2004, a Warsaw Uprising Museum has been open to the public. Since World War II Warsaw has been the second most important centre of film production in Poland. As the capital of Poland it has also been featured in countless movies, both Polish and foreign. Movies such as Kanał and Korczak by Andrzej Wajda, Eroica by Andrzej Munk, The Decalogue by Krzysztof Kieślowski, Miś by Stanisław Bareja or The Pianist by Roman Polański used Warsaw either as the background, or as the protagonist. 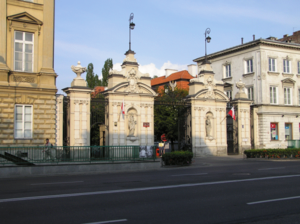 Main gate of Warsaw University. The overall number of students of all grades of education in Warsaw is almost 500,000 (29.2% of the city population; 2002). The number of university students is over 255,000. Warsaw at night. The Palace of Culture and Science, the city's tallest building and the 4th tallest in the European Union is visible on the right. 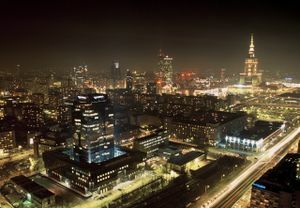 Warsaw, especially its downtown ( Śródmieście), is home not only to many national institutions and government agencies, but also to many domestic and international companies. In 2003, 268,307 companies were registered in the city. Warsaw is seen as the heart of Poland by foreign investors, whose financial participation in the city's development was estimated in 2002 at over 650 million euro. Warsaw produces more than 15% of Poland's national income. The GDP (PPP) per capita in Warsaw was about $28,000 in 2005. At the same time the unemployment rate is one of the lowest in Poland, not exceeding 6%, according to the official figures. The city itself collects around 8,740,882,000 złotys in taxes and direct government grants. It has been said that Warsaw, together with Frankfurt, London and Paris, is one of the tallest cities in Europe. 11 tallest skyscrapers of Poland, 9 of which are office buildings, are located in Warsaw. 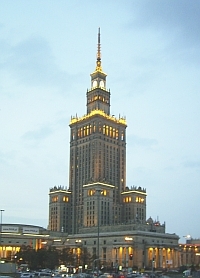 The centrally located tallest structure, the Palace of Culture and Science, is the 4th tallest building in the European Union. Although Warsaw was home to a stock exchange since 1817, in 1945, because of political changes after World War II, it could not be recreated. It only started operating again in April 1991, after the reintroduction of the free-market economy and democracy. It is now the biggest stock exchange in the country, with more than 250 companies listed. The main indexes of its performance are WIG and WIG20. History likes funny twists — it's worth mentioning that from 1991 until 2000 the Warsaw Stock Exchange was situated in the building previously used as the headquarters of the Polish Communist Party ( PZPR). Following the destruction of the city in World War II and its reconstruction, the communist authorities decided that Warsaw be rebuilt as a major industrial centre. Several hundred major factories were built in the city or just outside of it. Most notable were the Huta Warszawa Steel Works and two car factories. However, as the communist economical system deteriorated, most of them lost any significance. In the years following 1989, in the course of a peaceful transformation of both political and economical system in Poland, most of these went bankrupt. Nowadays, the Lucchini-Warszawa Steel Mill (formerly Huta Warszawa) is the only major factory remaining. 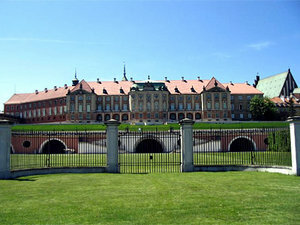 Although Warsaw is a reasonably new city, it has a lot of tourist attractions. Apart from the Old Town quarter, carefully reconstructed after World War II, each borough has something to offer. Among the most notable landmarks of the Old Town are the Royal Castle, King Zygmunt's Column, and the barbican. 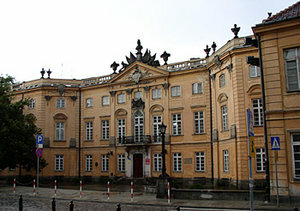 Further south is the so-called Royal Road, with lots of notable classicist palaces, the Presidential Palace and the Warsaw University campus. Also the popular Nowy Świat Street is worth mentioning. 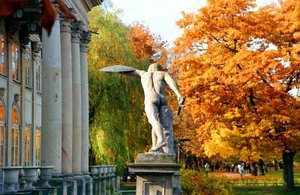 Warsaw's oldest public park, the Ogród Saski, is located within 10 minutes distance of the old town. Another such oasis of silence and serenity is the Powązki Cemetery, one of the oldest cemeteries in Europe, filled with hundreds of precious sculptures, some of them by the most renowned artists of the 19th and 20th centuries. Since it serves the religious communities of Warsaw, be it Catholics, Jews, Muslims or Protestants, it is often called a necropolis. Nearby is the Okopowa Street Jewish Cemetery, one of the largest Jewish cemeteries in Europe. To the north of the city centre the museum of the former Warsaw Ghetto is located, which is also a popular locality often visited by foreign tourists. 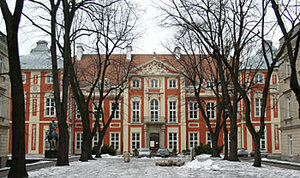 Also the borough of Żoliborz is famous for its architecture from the 1920s and 1930s. Between Żoliborz and the Vistula the Warsaw Citadel is located, a priceless monument of 19th century military architecture. 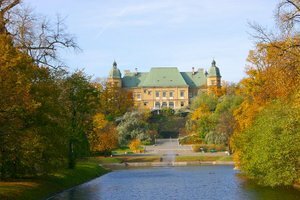 Also the former royal residencec of king Jan III Sobieski in Wilanów and Belweder are notable for their baroque architecture and beautiful parks. 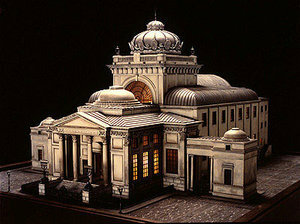 However, Warsaw is perhaps the most famous for several buildings from modern history. Apart from the Palace of Culture and Science, a Soc-realist skyscrapper located exactly in the city centre, the Stadion Dziesięciolecia which is the biggest market in Europe also attracts many tourists. For those who seek dramatic contrasts the borough of Central Praga is often the best choice. Called by the Varsovians the Bermuda Triangle for high crime rate, it is a place where almost completely demolished houses stand right next to modern apartment buildings and shopping malls. Also a Constitution square with its monumental socrealistic architecture should be mentioned. Ulica Kubusia Puchatka is a Warsaw street named after Winnie-the-Pooh. Every member of the Queen's Royal Hussars of the United Kingdom light cavalry wears the Maid of Warsaw, the crest of the City of Warsaw, on the left sleeve of his No. 2 (Service) Dress. One of David Bowie’s songs released in the album Low is called Warszawa. One of Joy Division’s songs released in the album Substance is called Warsaw. The band itself was previously called "Warsaw" as well. There is a Danish heavy metal band called Red Warszawa. Seated statue of Nicolaus Copernicus (Mikołaj Kopernik) by Bertel Thorvaldsen in front of the Polish Academy of Sciences. Zbigniew Brzeziński (b. 1928), political scientist, advisor to US President Jimmy Carter. Janusz Korczak (1878 or 1879-1942), writer, publicist, educator, children's rights advocate. Stefan Starzyński ( 1893– 1943? ), heroic mayor of Warsaw, 1934– 1939, murdered by the Nazis.